Hurtling through the atmosphere, naked and confused, my new RimWorld character has no idea what’s in store for him. The pod hits the surface and disintegrates, dumping its sweating, cursing cargo to the forest floor. The only thing left to do is survive. Thrive? Maybe. That comes later. RimWorld, one of the handful of games I consider to be the best of this decade, comes out of Early Access on October 17th, 2018. This will mark the end of a five-year journey which started when Tynan Sylvester had the idea to create a Kickstarter for a game many people tried to create but failed – the Dwarf Fortress-like. In my humble opinion, Dwarf Fortress is one of the finest games ever created. 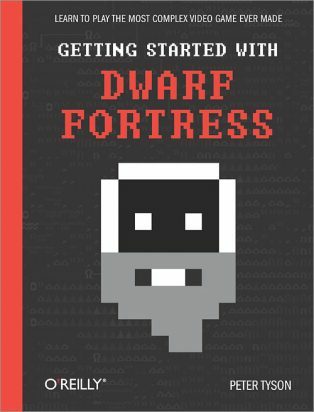 If it is possible in a fantasy setting, you are most likely to be able to do it in Dwarf Fortress. Featuring a robust physics engine and exceptional low-level management tools, Dwarf Fortress is a “great story generator.” I’m not going to take any real estate in my column talking about DF stories, but if you want to laugh, go check out Boatmurdered. For those not familiar with the conceit of Dwarf Fortress or RimWorld, let me take a moment to explain. You control a group of characters – mostly dwarves in Dwarf Fortress and regular humans in RimWorld – trying to survive in a hostile environment. The game is played top-down and is based on having little direct control over the inhabitants of your base. You set zones, tasks and jobs for the different little folks you have under your care based on their strengths and weaknesses and then oversee them as they go. Random events of varying risk and reward happen, and depending on your interactions, shape the way your game goes. It’s a game type that is, to me, very rewarding but also very challenging. As I mentioned before, many have tried to make a solid entry into the Dwarf Fortress arena. You see, DF is . . . not intuitive. In fact, I don’t know too many games that have an O’Reilly book dedicated to explaining how to play them. Hell, RimWorld isn’t the most intuitive game either, but at least you can control everything with the mouse cursor. Gnomoria, Towns and StoneHearth are a few of the games that have tried to jump into the “more accessible than Dwarf Fortress but enough like it to draw in its fans” ring. Each of them has reached a state where they decided the value of continuing work on the game isn’t high enough to attempt to reach a level of parity with their target. I believe this is key when considering these titles, RimWorld included, for one important reason – Dwarf Fortress is still being actively developed. The passion project of two brothers, Dwarf Fortress has been in active development for over a decade. It’s completely unfair to judge these other management sims alongside it because it continues to improve and grow. Tynan Sylvester has two key advantages with RimWorld. First, instead of focusing on physics simulation in a 3D world, RimWorld is set on one plane. That’s not to say there aren’t complex things going on here, but that’s a whole other ballpark. 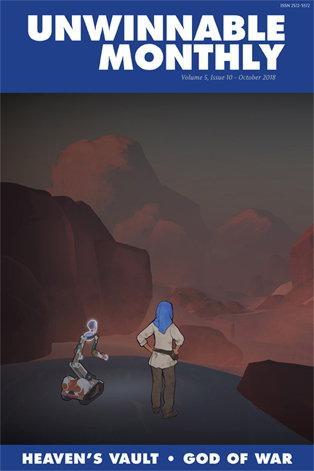 Second, this project has been in Early Access for over five years and is developed by a primarily one-man team. That’s not to say that others haven’t or don’t currently work on RimWorld, because they do, but for long stretches of development, the coding and direction were supplied solely by Tynan Sylvester. 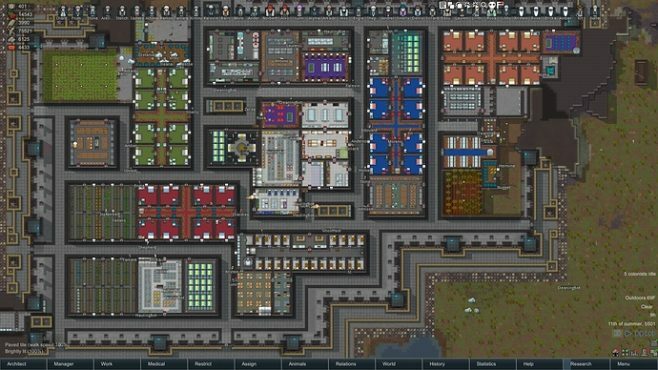 With the support of Kickstarter and EA funds, RimWorld has had the chance to grow and flourish where many others would collapse under the weight of their development expense. Back on the planet surface, our brave adventurer has started to scrape together a few basic amenities and is making a go of it. Luckily, this part of the planet is quite comfortable and lush. Having been a fighter in his previous life, before the abduction, my guy has carved himself a club out of a particularly hefty tree limb. This isn’t the safest world . . . Without the intense physics work that Dwarf Fortress does, RimWorld focuses on the interplay between different planetary tribes, hostile environments and ancient, alien robots. During all that, you also have to provide a comfortable and pleasing place for your folks to live (so they don’t go crazy and burn this mofo down) and make sure they can eat. It’s a lot of management and initial setup, but there are very few things as satisfying as a successful, fully-functioning base or escaping the planet (RimWorld win condition – don’t expect to see this often). After a few attacks from some hostile tribes, my colonist receives word that his wife has been kidnapped and is being held nearby. He packs up his rations and heads to the site. When he arrives, the captors don’t see him, allowing him to sneak up and dispatch one without much issue. The other runs away. His wife freed and back with him, they start the trek back to base. God knows what horrors await these two in the uncharted reaches of space . . . But I bet it will make a good story. 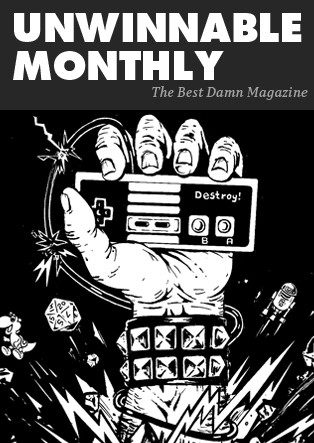 Jason McMaster is a writer and editor with a lifelong passion for games. When he isn’t working on Unwinnable, he’s either on his PC or playing a board game. Follow him on Twitter @mcmaster.